If you're an independent candidate for governor in Iowa, you know you're getting traction when your message earns the support of county chairs from both major parties across the state. Your campaign must be striking powerful chords when you get endorsements from both conservative talk-radio hosts and liberal-activist leaders alike. Jonathan Narcisse is running for governor again. (I have volunteered for and contributed to his campaign.) And if he garners at least 2 percent of Iowa's vote, the Iowa Party will have official party status, which means automatic ballot access for all partisan elections for the next four years. The potency of this political weapon cannot be overstated. Narcisse points out that partisan politics is the tail that wags the dog in Iowa, keeping voters distracted on presidential and national politics rather than focusing on how citizens' tax dollars are extracted and spent in their hometowns, school districts, and counties - right where they live. "The Occupy and Tea Party movements championed their causes through the Democrat and Republican parties, but after they helped get someone elected, they had no mechanism to hold them accountable," says Narcisse. "The Iowa Party is not ideologically driven; it is an accountability party." If Narcisse succeeds, the Iowa Party could be the "None of the Above" party that changes Iowa politics forever. The last time a third political party got four years of ballot access in Iowa was 2000, when Ralph Nader was the Iowa Green Party nominee for president of the United States. Nader received 2.2 percent of the votes cast for president in that general election, putting the Iowa Green Party on the ballot for the next four years. In 2004, however, the Iowa Green Party did not achieve the requisite 2 percent of the vote and lost its ballot access as an official party. The only other race through which a party can gain official status and ballot access in Iowa is for governor. Four years ago, running against two governors at once (incumbent Chet Culver and former Governor Terry Branstad), Narcisse garnered 1.84 percent of the vote. He got votes in all 99 counties and 1,720 out of 1,774 precincts. "That was the first time we had ever run a statewide campaign," says Narcisse. "We didn't know what we were doing. This time around we are still touching all 99 counties, but in the final weeks of the campaign we are going to focus our get-out-the-vote efforts in the urban population centers like Polk, Scott, and Blackhawk counties." If he can win 2 percent or more, Iowans will have a new third party devoted to Iowa issues, and to holding local elected officials and bureaucrats accountable to nonpartisan standards and policies that benefit Iowans. If candidates from either the Democrat or Republican party do not perform, the Iowa Party will recruit challengers from their respective parties to replace them. The big distinction here is that the competition is from within the parties. Instead of recruiting Democrats to run against Republicans and vice versa, the Iowa Party is structured to find candidates to run against their own party's incumbents who have let Iowans down. This same process will also protect incumbents who genuinely represent Iowans, regardless of party. It is an extremely powerful tool for holding elected officials accountable to Iowans. Narcisse has been active in politics and elections for more than 30 years. At the tender age of 20, he was elected co-chair of the powerful Polk County Democratic Party. In 1986, he ran as a Republican for the state Senate - against his current Democratic opponent for governor, Jack Hatch - and made CNN with more than 1,000 black voters who crossed party lines and protested the racism of the state Democratic party. He worked on Capitol Hill for District of Columbia congressional delegate Walter E. Fauntroy. He received awards from both the Bush and Clinton administrations. He received recognition from the first Branstad administration and the Vilsack and Culver administrations. In 2007, he was elected to the Des Moines School Board, where in just two years he exposed massive corruption in consulting and building contracts worth $300 million of new construction. While there, he documented and exposed the falsification of graduation rates and identified that Iowans were funding the "education" of more than 60,000 nonexistent students - costing taxpayers almost $500 million annually. He chaired the state Commission on the Status of African Americans in the late 1980s and early '90s. And, from 2001 to 2003, he conducted a 99-county tour under the banner of the State of Black Iowa Initiative, during which he hosted hearings that brought accountability and change to school boards, superintendents, and state legislators. Narcisse's efforts and ideas for education reform garnered enough attention that he was the contact that Secretary of Education Arne Duncan's regional director of education made before Duncan's first visit to Iowa. In September 2009, Narcisse unveiled "An Iowa Worth Fighting for: A 10-Step Vision Plan for 21st Century Governance" (AnIowaWorthFightingFor.com). For this effort, he had the direct input and support of two co-chairs, former Branstad Chief of Staff and former Director of the Iowa Department of Management Gretchen Tegeler and Samuel Clovis, a professor at Morningside College. Through these efforts, Narcisse has been steadily establishing a published and documented foundation of how an Iowa Party would govern and address real reform - with specifics - that is unmatched by any other candidate on the ballot. At his Web site (NarcisseForGovernor.com), one can watch videos that address issues from tax reform to education reform. One can download and review two white papers: "Restoring Iowa's World-Class Education System" (RCReader.com/y/narcisse1) and "An Engine, Not a Motor for Iowa's Economy" (RCReader.com/y/narcisse2). Within the pages of his 2010 campaign piece "Iowa Values, Common Sense Solutions" (RCReader.com/y/narcisse3), Narcisse writes: "Every government bureaucracy that exists, every division, every bureau, every title, every staff position, every funded program, every appropriation, and every expenditure must be subordinate to these considerations: (1) Is it necessary for government to do this? (2) Is it outcome- and results-oriented? (3) Is it accountable to the public? (4) Is it competently staffed, efficient, and effective? (5) Is it responsive, not reactionary? (6) Is it impartial and consistent? Overarching principle: Government must be braced by personal responsibility." Narcisse backs up the rhetoric and sloganeering with tangible actions and solutions a governor can implement. For example, requiring state ID to use one's EBT or food-stamp card would ensure more families get the food the program was intended for. Narcisse sees the intentions of a social-welfare program being abused to fund powerful corporate welfare. "I have to show ID to cash a check at Hy-Vee, but people can use an EBT card they bought on the black market, fueling the purchase of illegal drugs, alcohol, and gambling. I'm tired of making people rich in the name of compassion, while we pay for it." On tax reform, Narcisse asserts that Iowa is powering an economic motor from without - not an economic engine from within - by taxing poor and middle-class single moms on their overtime and proposing an increase in the gas tax while giving away millions to the likes of Google, Microsoft, and Orascom. He points out that when a run-down building or house in a central city gets improvements, the property taxes go up because of the increased property value - creating a disincentive. And when powerful special interests and developers dangle the promise of more retail jobs or an increase in casino revenues, he says, "we go to great lengths to run sewer, water, and lights on the taxpayer's back so we can cover the richest soil in the world with parking lots and cement." He advocates freezing the assessed value of commercial and residential property at the price that was paid for it, incentivizing infill and rehabilitation within our existing neighborhoods. He also advocates a 25-percent rebate on the state income tax so Iowans can invest in charities, businesses, and startups of their choosing. And he advocates phasing out the corporate income tax. He points out that when the respective major-party candidates for governor, Branstad and Hatch, both came into Iowa office in the early '70s, Iowa had six congressional seats at the federal level. After more than 40 years of the "Branstad Era," we have only four congressional seats because of Iowa's population. "Iowa's tax code is one of the single biggest contributors to our state's stagnation," Narcisse says. "We don't have a revenue problem. We have a spending problem." He notes that despite the purported "conservative" credentials of the Republican governor, there has not been a single year when the state budget approved by Branstad was smaller than the previous year. "We will cut a lot of taxes, but we will also cut a lot of spending," says Narcisse. Some of those cuts would come from eliminating waste within education. After studying the education system in Iowa arguably more than anyone else currently in office, Narcisse estimates that there is room to cut up to 17,000 jobs, from local school districts to the Regents-run state universities. "We have over 45,000 people employed by the Board of Regents for under 80,000 students," he says. "That's ridiculous." His favorite example of how bloated local school districts are is Albert City-Truesdale, where a staff of more than 35 - including a superintendent, two business managers, a transportation manager, and numerous secretaries - serves 94 students. And, of course, there are the more than 60,000 nonexistent students that get funding of approximately $8,000 per student - or nearly $500 million annually. Narcisse was live on WHO radio in Des Moines with Branstad and broached the topic of phantom students; Branstad acknowledged they existed but offered no tangible action step to cease this practice. When it comes to governance, Narcisse states he will be the Chief Accountability Officer inside Iowa's powerful executive branch. "The main job of the governor is to appoint good men and women to boards and commissions," he says. "Public servants that will put the interest of Iowans, our citizens, our taxpayers, our families, and our children first and foremost in their decision-making and in their actions. And then to hold them accountable. ?And to protect Iowans from those who would take advantage of our state and our goodwill." The Washington Post reported that 16 percent of Branstand's appointments came from his donors. (RCReader.com/y/narcisse4). 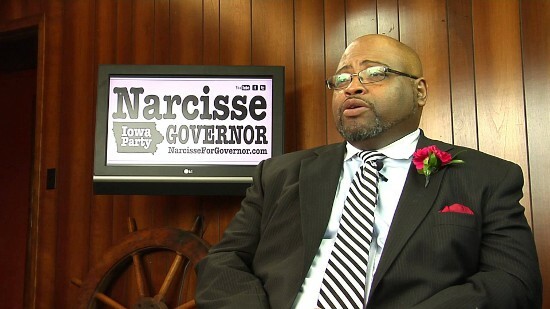 Narcisse hopes his candidacy and the Iowa Party effort expose what he calls the Polk County Political Cartel. In a news release (RCReader.com/y/narcisse5), Narcisse stated: "While certain compromised media has shielded Iowans from truths like Terry Branstad's biggest contributor is his opponent's business partner [RCReader.com/y/narcisse6], we will make Iowans aware of these facts and others such as the disproportionate representation Polk County residents have on our state's boards and commissions [RCReader.com/y/narcisse7]. For example, a majority of the members on the State Utility Board and the Iowa Public Broadcasting Board are from Polk County. And four of the nine members who sit on the Iowa Court of Appeals hail from Polk County." If Narcisse gets more than the 2 percent of Iowa votes, the hard work begins after November 4. But his statewide county tours of duty have positioned the Iowa Party to be well-received outside of the Gannett- and Lee Enterprises-controlled print media across the state. His runs at the governor's office have garnered him contacts, coverage, and support with most of the non-major media in small to medium towns throughout Iowa, who are responsive to his "outside the Polk County Cartel" messaging. 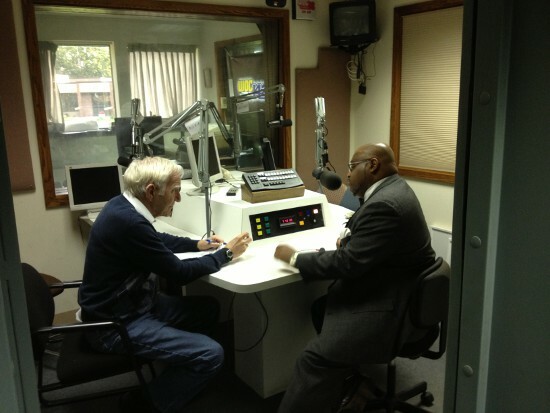 Inside Des Moines, he has huge name recognition from his days on the school board, and he is a regular on morning and afternoon talk radio at WHO. In Davenport, Jim Fisher endorsed Narcisse live on the air last month, telling listeners of WOC radio that "there is a choice." And in Waterloo, award-winning TV journalist Ron Steele hosted Narcisse for the Steele Report, stating, "Jonathan is the third candidate for governor on the ballot in 2014." Narcisse has asserted: "Yes, while we are technically not a democracy, we are not a republic now, either. We are inside enemy-occupied territory." With just 2 percent of the vote, the Iowa Party will gain official party status and ballot access. The proverbial bird of prey with two wings - the Republicans and Democrats - could be facing a predator it has never seen before in Iowa. "We are building a potent statewide political tool that will help us recruit good candidates to run for local office - school board, city council, and county seats - as well as legislative candidates we will encourage to run in primaries where our organizational muscle will help them oust vulnerable incumbents in the June elections," Narcisse says. "We will especially present a second party alternative where incumbent Democrats and Republicans at the county and legislative levels are re-elected term after term without ever facing a viable opponent, if any at all." Jonthan Narcisse will be speaking at the Genesis Heart Institute (1236 East Rusholme Street in Davenport) inside the Adler wing at 3 p.m. on Wednesday, October 22. He will be addressing invited Genesis employees, and the public is welcome to attend. At 6:30 p.m. on October 22, Narcisse will be delivering a tax-reform policy speech in Room 1006 at the Kahl Educational Center (326 West Third Street, Davenport). For more information on Jonathan Narcisse, visit NarcisseForGovernor.com.